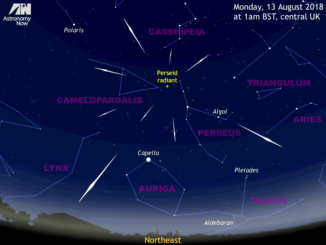 From the UK evening of Sunday, 12 August into the early hours of the following morning it’s the maximum of the annual Perseid meteor shower. This year, a new Moon setting in twilight makes prospects for watching this natural firework display particularly good. So, find somewhere away from the streetlights, settle into a garden lounger facing northeast and enjoy the show! If skies are clear between moonset and the first glimmer of dawn this weekend, you may get to see some celestial fireworks from the Lyrid meteor shower. 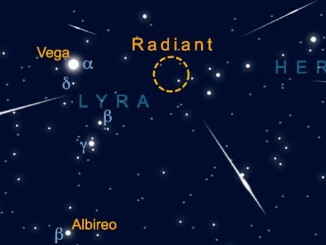 While it may not be the richest of the annual shooting star displays, the Lyrids can deliver a few fireballs and a portion of these medium-speed meteors can leave glowing trains. 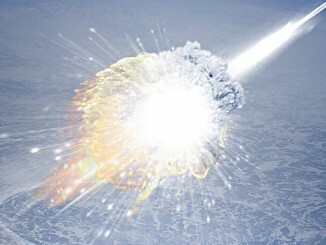 Observers across the British Isles report a fireball seen shortly before 3:17am GMT on 17 March. 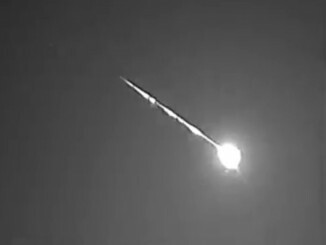 The UK Meteor Observation Network’s monochrome camera in Church Crookham, Hampshire also recorded the spectacular event, which lasted for several seconds and was seen for hundreds of miles. 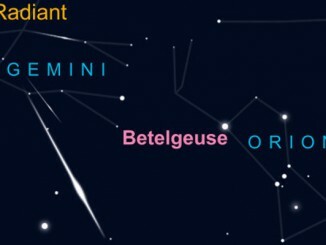 The Geminids of 8—17 December are widely regarded as the most active and consistent annual meteor shower, with peak predicted rates of 100 shooting stars per hour under dark skies. 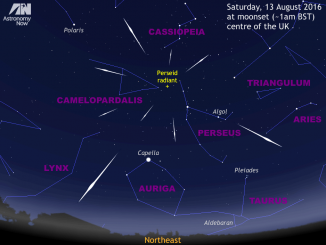 With new Moon occurring on Friday, 11 December, prospects for this year’s Geminid display are therefore expected to be very favourable — UK weather permitting! 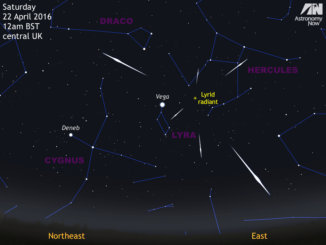 With a young crescent Moon setting around midnight for the peak of the Lyrid meteor shower, prospects are good for this annual display that can produce medium-speed fireballs. Two years ago, on February 15th, the morning routine of the Chelyabinsk region in Russia was shattered by the arrival of a 20-metre-wide meteoroid that dramatically fragmented in the atmosphere. The ensuing shockwave shattered windows, damaged buildings and 1,491 people received injuries. What have we learned since 2013?